Take a moment to think about how nice it would be to enhance the look for your skin while slimming down your body at the same time. This hypothetical situation probably seems like a pipe dream. It is now possible thanks to VelaShape 3. This amazing device decreases that annoying fat that will not go away no matter how hard you try. It is perfect for those troublesome fatty areas like the thighs, abs, neck and arms. In fact, most of those who try VelaShape 3 find it provides meaningful results after a couple treatment sessions. In some cases, notable visible improvements occur after a single session. 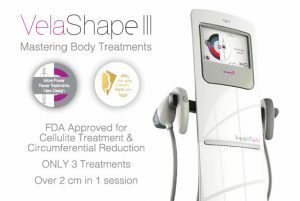 What is Vela Shape 3? This non-surgical approach to beatifying the body is completely safe. Give the VelaShape 3 a try and you will find your confidence soars after one or two treatments. This FDA-approved device shapes, slims and contours the body by eliminating cellulite. It also firms up those problem portions of the body to boot. The final result is a considerable reduction in cellulite that enhances your appearance and makes you feel that much better about your appearance. The best part is you do not have to go under the knife or endure pain of any sort. VelaShape 3 has emerged as a popular means of eliminating fat and toning the body because it works without requiring surgery or a massive time commitment. Treatment sessions with this device last a mere fifteen minutes. These short sessions produce some truly amazing results. There is minimal, if any discomfort. You are provided with the contoured body of your dreams yet you do not have to invest thousands of hours in the gym. This is a proven means of thwarting that ugly cellulite. Cellulite is quite the egregious problem in those who have a genetic predisposition toward developing it. In fact, cellulite has the potential to reach the point where its fibrous bands are strong enough to pull the skin on down and create a deformity in the form of excessive dimpling. Even those who are skinny can have cellulite. VelaShape 3 will slim these problem spaces to give you the look and comfort you have been hoping for. It is especially effective in those difficult areas around the thighs, hips and stomach. The VelaShape 3 machine makes use of four unique technologies: Massage rollers, Pulsed vacuum, Bi-polar radio frequency and infrared heat. These technologies work in unison to enhance the texture of the skin and decrease the volume of the area to be treated. This is a non-surgical treatment so the results produced by VelaShape 3 will not be permanent. If you do not mind repeat treatments a couple of times per year to keep the same smooth look, you should give serious consideration to this unique treatment modality. You will feel minimal pulling/heat during the treatment. Think of the VelaShape 3 as a heated massage that beautifies your skin without requiring any type of surgery. Give VelaShape 3 a chance and you will find it really does make you look and feel that much younger.